C1S7CD14 Picked by @helenburdess over worked and underpaid, but always working hard and with a smile on her face. Lone Justice were one of the forerunners of what we now call Americana or Alt-Country but at the time I don’t even think we had a word made up for what Lone Justice, Green on Red and maybe The Long Ryders were doing. Whilst listening to this the word Cowpunk came into my head, and reading the liner notes this is mentioned, it also sounds very rockabilly in parts but it adds up to country with a bit of an edge, or as already mentioned Americana as we know it today. Lone Justice released 2 albums in the mid Eighties, their self titled debut and the follow up Shelter and for a time were the darlings of the music industry, receiving glowing reviews and supporting U2 across America. Sadly they disappeared as quickly as they had appeared. This compilation is a reflection in how short Lone Justice’s recording career was as it is a bit of a ‘Best Of’ and a bit of a ‘Rarities’ collection with a couple of live versions thrown in for good measure and sadly this makes it really a bit of a ‘pigs ear’ as we would say in the North east of England. It’s a bit of mess. We have 3 tracks from both their studio albums, a couple of live versions of favourites, plus 6 unreleased which may have been B-sides and a couple of covers including Lou Reed’s Sweet Jane on which Bono lends a hand. As an album it’s all over the place, the running order seems weird and you don't get to see the progression that you can see in the 2 original releases, from the rawness of the first album to the subtleness of the second album where Maria McKee seems to want to control her voice more rather than blasting each song as if it was her last. I love the 2 original Lone Justice albums I have they really mark an exciting time in music for me, where a new genre of music was evolving and it’s a genre I still love now, but this compilation adds very little to the work of Lone Justice and in some ways listened to in isolation devalues the music they made. Maria McKee went on to be a solo artist and in Show Me Heaven (From the film Days of Thunder) a ‘One Hit Wonder’ in the UK. Her solo work has been of the highness quality and deserves more credit than it has been received. I especially love the album ‘You Gotta Sin To Get Saved’ which is possibly her most commercial work. My little bit of trivia with regard to Maria McKee is that she wrote A Good Heart which was a hit for Fergal Sharkey, who then recorded You Little Thief which was written be McKee’s ex boyfriend Benmont Tench, both songs were about their failed relationship! 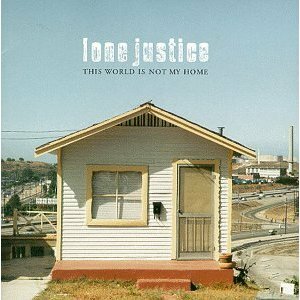 If you a fan of Americana then Lone Justice are worth looking in to but I wouldn’t start with this CD, pick either of their original recordings.